This Celtic Weave Wedding Band has a Celtic pattern going around the ring. I can make them in widths from 7 to 16mm wide and in a variety of profiles as well. Do you have another idea for a Celtic Wedding Band? Send it to us and let us show you what we can do. METAL OPTIONS: Bronze, Brass, Copper, Sterling Silver, Rose Gold, Yellow Gold, White Gold, and Platinum. WIDTHS: Depending on the design, 4mm is usually the narrowest that can be used for a simpler pattern. 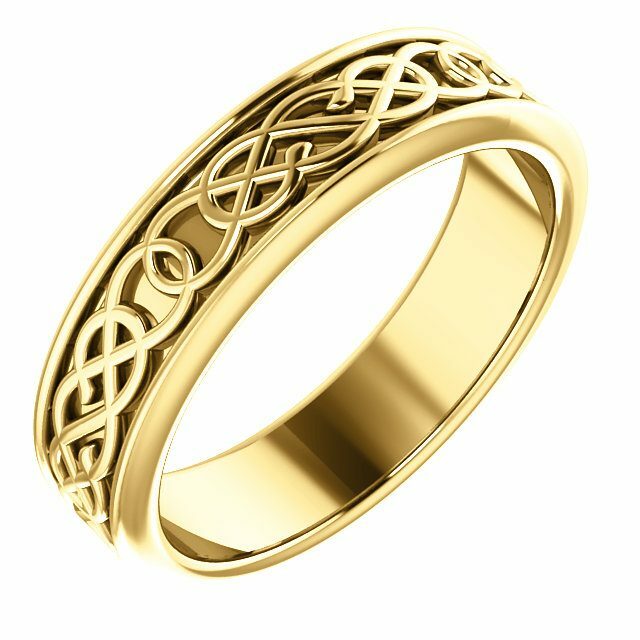 The starting price is for 10K Gold Celtic Weave Wedding Band at 7mm wide. Contact us for other pricing options. Click HERE for another Celtic Weave Wedding Band design or contact us with your own custom wedding ring idea.